Profitez de la vue magnifique sur le magnifique océan, le parcours de golf luxuriant et la charmante ville de San Jose del Cabo à partir de ce condo de luxe, situé au sommet du point culminant de San Jose. Nous avons immédiatement attiré Alegranza qui a le meilleur emplacement, les points de vue et la qualité de construction que nous avons vu dans la région. Téléviseurs dans les 3 chambres et le salon. This condo is great for families with huge bedrooms and plenty of bathrooms. It is very well stocked with everything you may need from beach towels to coolers to tennis rackets and balls! The pools and facilities of the resort are great- definitely try the burgers near the middle pool- they are sensational and the staff were amazingly helpful. I wish we didn’t live on the other side of the world as we would vacation here regularly! We did have an issue with water but it was quickly fixed- don’t be afraid to ask the staff as they are amazingly helpful. Thanks for a great stay! The property and the interior of the condo is much lovelier than the pictures! Darlene’s condo was very clean, modern, and comfortable, and perfect size for my family. The complex is very safe and secure. The central location of this condo makes it perfect for foot travel around the city. Walmart was an easy 7 blocks away, and beach access was about 9 blocks. It was also very easy to walk downtown to enjoy San Jose’s lovely town square. I felt very safe going on long morning walks throughout the city, and there is a very nice bike path that runs in front of the hotel zone. The pool area of the condo was beautiful, and the landscape has matured greatly since the photo was taken. The gardeners worked hard every day to keep the landscaping immaculate around the condo complex. We especially enjoyed the ocean view from Darlene’s patio, and we spent a great deal of time relaxing outdoors on the terrace. We learned how easy it was to take the purple/orange bus to San Lucas ($2 usd per person), and we enjoyed spending a day at the marina. No need for reservations for a boat ride around the Arch. There are numerous captains begging for your business. Our stay in Darlene’s condo was perfect in every way, and we look forward to returning to San Jose! Great place for the price. Good location in San Jose! Great week. Few maintenance issues that were fixed quite quickly by the local contact. AC works great. A lot of extras including towels, umbrellas, ice chest, and various other toys. Thank you for taking the time to write a review of my condo. I am happy that you enjoyed your stay. Please come back again. Home away from home is what youll find! The condo is everything you’ll need! Beautiful rooms, balcony, views! Everything comfortable so we were able start relaxing right way. There are three pools at Allegranza, one more spectacular than the the other. Each has a pool house, bathrooms, barbecue and lounge if you wanted to have a party outside. The property has matured tropical landscaping everywhere, you feel like you are in a private paradise. The picture listed on HomeAway of the pool must have been taken when construction first started, It is now matured and completely filled in with beautiful vegetation, palms, plants flowers. Inside the condo you have everything stocked for you in the kitchen like pots, pans, glassware, everything works very well. Air-conditioning in all rooms each have their individual control and setting. Ceiling fans in all the rooms as well. It was 90° Im SJD, so that was very nice to have a cool temperature all the time. The pool was never crowded and very tranquil. There is even a small putting green for those who want to practice swing. The best grocery store to shop at is LaComer formally Mega. They have a better variety of foods, cheeses, wines, beers and an amazing bakery. The best grocery store with a beautiful ocean view. The area is very secure, very private, very safe, you can walk in the evening see lots of shops and SJD downtown is a five minute drive. I recommend this place to anybody who wants to have a relaxing vacation with friends or family or a couple, it has everything you need. Thank you for taking the time to write a review of our condo. I am happy that you enjoyed your vacation. 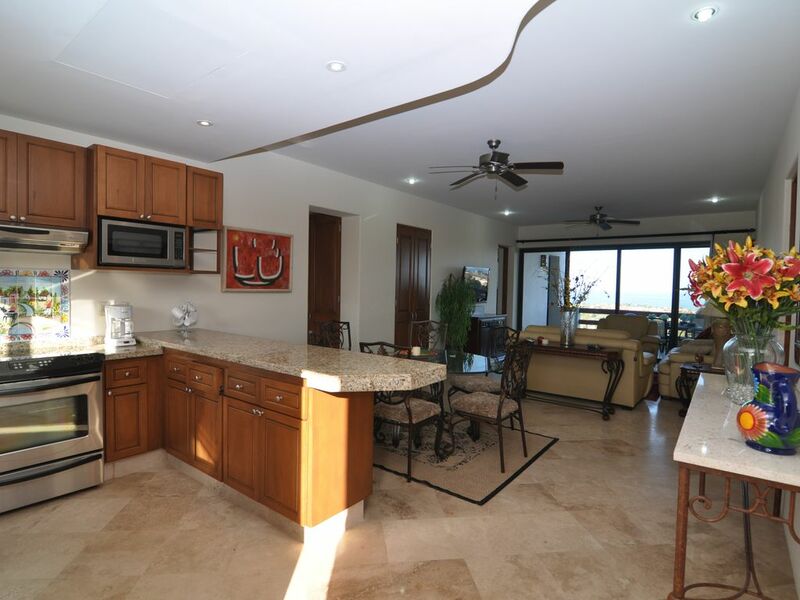 You have captured the essence of Cabo San Jose, Alegranza Resort, and our condo. Upon walking into Darlene's condo, I had an inkling we would enjoy our stay there. The kitchen was ample & well stocked, the master suite/master bath were enormous (as was the junior master & bath) & the patio was large with a grill & a great view of the pool. What I didn't expect was to be able to order room service for breakfast, walk down every morning to a gym that had more than your standard treadmill & weights, & have the luxury to have an in-room massage, facial and mani/pedi while watching my hubby & boys play at the pool (for an extremely affordable price at that too!) I have to say I enjoyed my time more at the condo than in being out & about in San Jose del Cabo. This was because the entire main square downtown was under construction and it was sweltering hot every day. Luckily a very nice family beach (close to the Palmilla golf resort) was a ten minute drive away. Coming back to the condo and turning on the AC was such a relief after a day out. The condo was well furnished, the mattresses were on the firmer side but the bedding was so soft that we all slept very well. The walls and floor were very thick and didn't transfer sound, which was key to me not having to worry about any noise my two toddler boys were making. We couldn't hear a peep from the neighbors either for that matter. Checking in and checking out was very easy & the property manager and the owner Darlene were both very responsive any time we had a question. They were a pleasure to work with. My deposit was refunded rather quickly so all in all our vacation went smoothly without any issues. I would highly recommend staying here. Thank you for taking the time to write a review. I am happy that your family enjoyed your stay. I look forward to welcoming you back. What a great place to stay when visiting San Jose del Cabo. You're greeted with beautiful views right from your balcony and get to enjoy a very spacious 3 bedroom, 3 full bathroom condo equipped with an open floor plan and gorgeous granite countertops in the kitchen; along with the nicely decorated dining area and living room make this condominium one of my favorites. Everything in it is very upscale and more than I was expecting for an extremely really affordable price. I was very impressed with the service provided by the owner and company managing the rental property; they were always very prompt solving any questions I had and not just that but an email from the owner always followed to make sure that we had a satisfactory solution to our inquiries. We visited in June, and every day we had the pool and the jacuzzi to ourselves, the property has 3 pools and a restaurant on site that serves breakfast, lunch & dinner and to top it all of they deliver! Awesome! By far one of the best places I have stayed when in San Jose del Cabo, I would highly recommend to everybody with assurance that you too will love this place!! The cost for 7 days is $1050 with a $300 refundable security deposit. The price for 2 weeks is $1800 with a $500 refundable security deposit. The cost for 3 weeks is $2500 with the $500 refundable deposit, and one month is $3,000 including utilities, plus a $500 refundable security deposit. The security deposit is refundable as long as the condo is left in the same condition as it is found.